I registered with you at the very first and changed the temporary password given at the time by my own. But unfortunately I have forgotten the password and been trying to retrieve by furnishing my E-mail ID to you.Iget the message on screen that my name n password details are sent to mail e-mail address but unfortunately, inspite of doing it a few times, I do naot get any mail reg/the subject at all. just click the button placed below the advertisement bar. In the above image, you are seeing nine menus horizontally. You have to try clicking on that to get new information. Members are just seeing only the message using the link that they have got through email(?) I hope. Under the Useful Menu you could find 10 other links to get ten different useful matters. In the first image you see in yellow bank ground "Thanks! Visit often" welcome message. which is for a verification that you are human, then finally click the "Request Username" button in the bottom right corner. Now immediately go to your inbox, you will find a link to change your password. Also, you can change any of your information by clicking the "Settings" at the top right corner of every page. Here under I had given all the links for you by which you can change your settings. 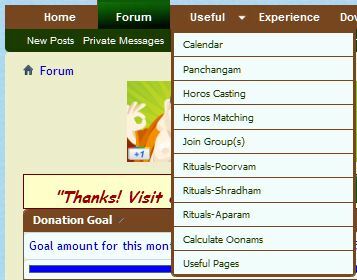 Please use the forum effectively by clicking here and there.